Remember when these cars were everywhere? For awhile, you couldn't drive past a corner used car lot, a high school parking lot, or a commuter train station without seeing at least one of these cars. Often several. It seems like they're all gone now. 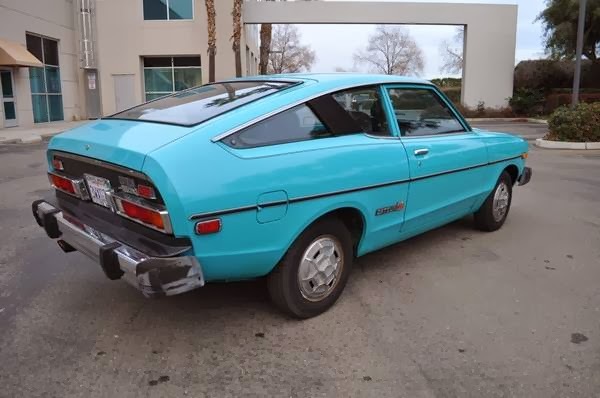 Nissan / Datsun sold a ton of these cars in North America. They were solid, yet unexciting. The 1.4 liter engine produces 70 HP. That's enough to get the B-210 to 60 in 13.5 seconds. It can easily get 35 MPG. It has a theoretical top speed of 100 MPH. 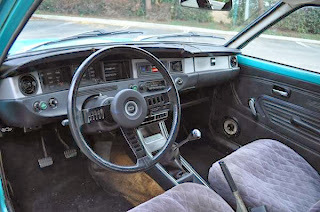 The interior is a typical 1970s Japanese interior. It is well constructed, but the materials look and feel cheap. 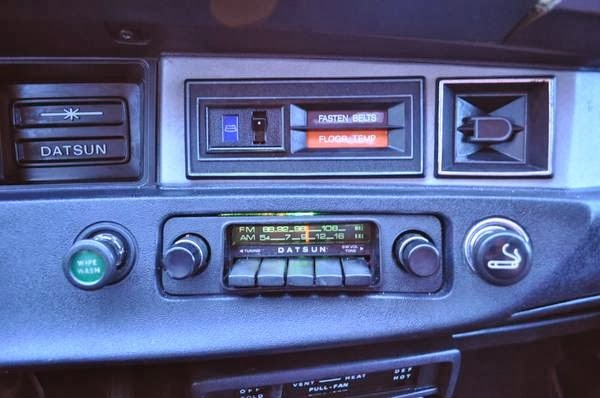 The dashboard has a few quirky angles and features, but it's well laid out. The seats are thin, but comfortable enough for short commutes. There is something about the body that I can't put my finger on. Something that's not right. It's neither ugly nor good looking. It has all the design cues a sporty car should have, but it doesn't look sporty. I even did a search for pictures of these cars without the awful US-spec 5 MPH bumpers. It still didn't look right. Over-styled? Under-styled? I don't know. 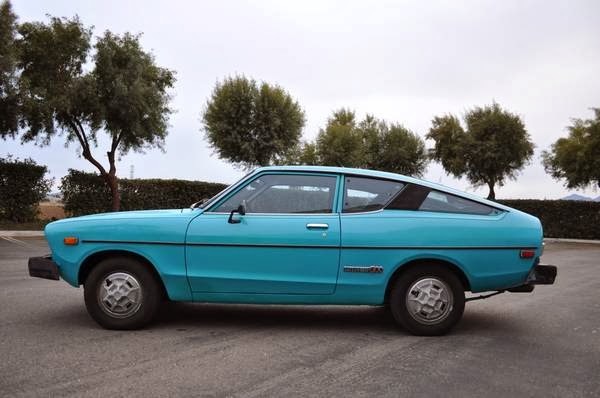 It's as if the Nissan / Datsun stylists knew where the wanted to go, but couldn't figure out how to get there. The B-210 will run forever. The bodies, however, are damn-near water soluble. Most of these cars were scrapped because of voracious rust that rivaled the Italian cars of the day. This car is a remarkable survivor. The oh-so-seventies turquoise body looks rust and dent free. The interior looks clean, but the dashboard padding is cracked and I suspect the front seat covers are hiding some damage. (Might as well leave them there. The extra millimeter or two of padding will be appreciated.) The engine has had some recent work and is said to run well. 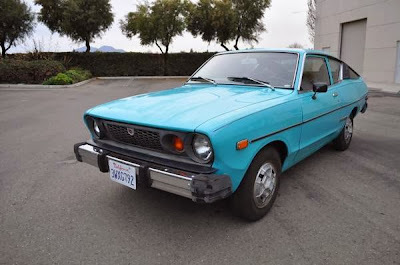 These days, it seems like all old Japanese cars are purchased by kids and tuners. They are modified (sometimes very poorly) to within inches of their life. This car is too good, too original, to receive that fate. I'm just not sure it's interesting enough to escape it. I hope there is a Nissan / Datsun fan out there who can appreciate this car for what it is. 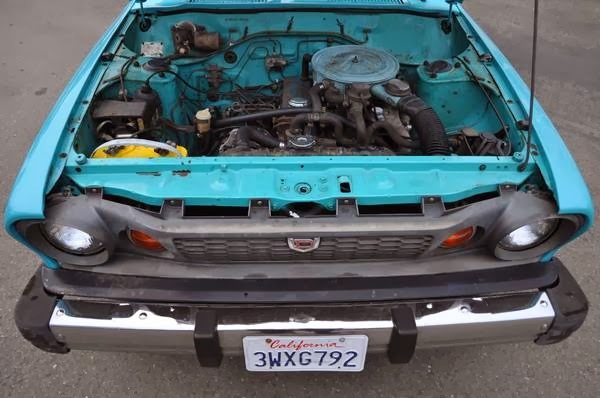 Located in Brentwood / Oakley, CA, click here to see the Craigslist ad. Had two of these back in the day. The first one eventually had plywood where the floors used to be. 2nd one was that horrid yellow-orange color. Abandoned it when it died alongside Route 80 in Pennsylvania. Reliable but boring. Yeah these things were EVERYWHERE and I even remember back then thinking that they were very odd looking cars. Nothing like their F-10 or 200SX but still very odd. Part of that was probably due to the honeycomb/Jiffy Pop popcorn wheel covers which they now seem to use on Almost Human to denote the 'future'. Apparently in fifty years, we will still be driving this generation Ford Fusions but without the Ford logo and with puffy wheel covers. But I digress....the blue is a color I do not remember but I vividly remember the yellow/orange color that the first commenter stated that he owned. Somehow that seems to have been the most popular color of the B-210. 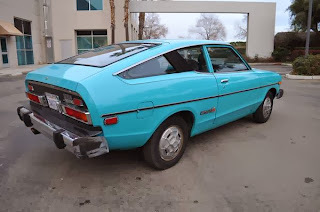 This generation also had the more awkward notchback...now that would be a find as well. 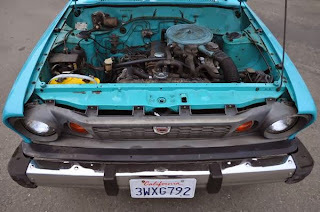 These things were notorious for blowing head gaskets if the heads where not periodically retorqued. This was the premium model. Most of them I recall were the value focused notchbacks, dubbed the "Honey Bee". 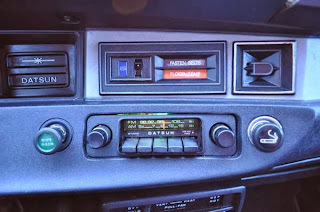 These were all yellow (which faded quickly to a baby diarrhea tone) and featured a simpler, all black, dash. A number of my friends had them and even they agreed my Chevette was a better car. Now you know, if the Chevette is the consensus choice as the superior car, these things were crap. Rode in one in Kenya when I was little... all I can remember is don't sit on the hump (middle rear seat) and little kids jumping a ride on the back bumper. Or back something, it's a little blurry since I was not even 3. I featured one a while back that was lowered over period mesh wheels, and it actually improved the looks substantially - emphasized the length and brought the sporty design cues forward. I know I'm way late to this party, but as a former Californian, perhaps I can explain the "back fees." These are past-due registration fees, obviously. They must be paid before the vehicle can be operated legally or--as you correctly assumed--its registration and title can be transferred to a new owner. When I bought a 1991 F-150 with back fees owed, the California DMV waived all but the first and most recent years' fees. One can also get around the back fees by salvaging the vehicle or possibly waiting for it to fall out of the DMV's system. In the latter case, that used to happen after seven years, but it may now be ten...if they fall out of the system at all. Hopefully that has been a helpful explanation.